Despite international condemnation, Israel continues to flout international humanitarian law ordering African migrants, notably Sudanese and Eritreans, to leave the country by the end of March or face jail. Rights groups estimate the number of African migrants/asylum seekers in Israel at 40,000. The plan suggests that those who leave before the end of March will receive $3,500, along with airfare and other incentives. Thousands of Africans entered Israel before it erected a fence along its border with Egypt. Many say they fled conflict and persecution and seek refugee status. 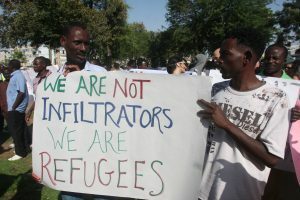 Israel calls them “infiltrators” and says they are mostly economic migrants whose numbers threaten its Jewish character. Written by: Jaber Ali on January 3, 2018. Posted by Jaber Ali on Jan 3 2018. Filed under Headlines, World News. You can follow any responses to this entry through the RSS 2.0. Both comments and pings are currently closed.